The Gorilla Ladders 3-Step Aluminum Ladder with utility tray is incredibly lightweight, weighing less than 8 lbs., yet durable with a 225 lb. weight capacity. The updated design allows the ladder to be easily transported, set up and stored. The huge top platform step offers a stable and secure standing area while the self-locking safety latch is easy to use and provides locked-in protection. The built-in utility tray is perfect for tools, paint and hardware and comes in handy when cleaning, changing light bulbs and painting trim, hanging pictures or completing any other household project. Utility tray for hardware, tools, paint, etc. 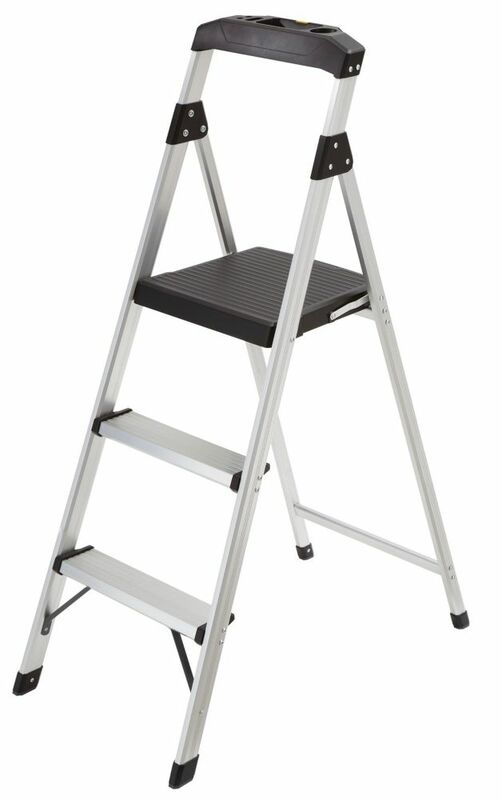 With an oversized top step and large hoop back, this 2-Step Steel Step Stool is safe, sturdy, and stable. The soft comfort grip makes climbing and transporting the stool easy. An integrated safety latch keeps the ladder locked while in use for added security while climbing. Gorilla Ladders 3-Step Lightweight Aluminum Step Stool The Gorilla Ladders 3-Step Aluminum Ladder with utility tray is incredibly lightweight, weighing less than 8 lbs., yet durable with a 225 lb. weight capacity. The updated design allows the ladder to be easily transported, set up and stored. The huge top platform step offers a stable and secure standing area while the self-locking safety latch is easy to use and provides locked-in protection. The built-in utility tray is perfect for tools, paint and hardware and comes in handy when cleaning, changing light bulbs and painting trim, hanging pictures or completing any other household project.